"Walking the Second Mile: Women, Religion and Philanthropy"
Ann Braude serves as the director of the Women's Studies in Religion Program and as Senior Lecturer on American Religious History at Harvard Divinity School. Her primary interest is the religious history of American women. Her first book, Radical Spirits: Spiritualism and Women's Rights in Nineteenth-century America, documents the role of spiritualist trance speakers as the first large group of American women to speak in public, and examines the sympathy between the radical individualism of their religious practices with that of their political platform. Ann Braude is also the author of Sisters and Saints: Women and Religion in America, a history of the religion of American women for a general audience. She also has an interest in the issues surrounding the study of Native American religions, and is engaged in an ongoing research project concerning a Cheyenne child taken captive at the Sand Creek Massacre. 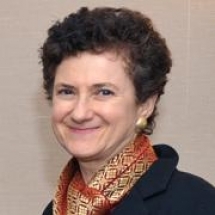 She has published many articles on women in Judaism, Christian Science, and American religious life, and served as co-editor of Root of Bitterness: Documents of the Social History of American Women. She edited Transforming the Faiths of Our Fathers: The Women Who Changed American Religion, the result of a historic conference that brought 25 pioneers of religious feminism together at HDS. In 2005 she inaugurated the School's year-long celebration of the 50th anniversary of the admission of women to HDS with a convocation address entitled "A Short Half-Century: Fifty Years of Women at Harvard Divinity School." Religion, Gender and Politics: Untangling Modernity, which she co-edited with Hanna Herzog, appeared in 2009. Her current research focuses on religion and women's political mobilization.